RIPCC | Watts Up With That? Surrounding these recent revelations, some hilarity from the world’s preeminent skeptic cartoonist, Josh. August 31, 2010 in Humor, Satire. A celebration, some fireworks, in the background would be a nice touch. They get 72 climate virgins, so they’re laughing. Don’t doubt for a minute that the Frankensteins who built this monster will try to revivify it as long as they have any power at all. It’s more like news of its death have been greatly exaggerated; bureaucracies never die, they just mutate into more deadly forms. Well, maybe now skeptics will focus on the EPA. Through the EPA’s greenhouse gas regulations the undead IPCC lives on. EPA regulations to limit GHG emissions are on the books and have the force of law unless reversed by the courts or legislatively preempted by a law that Congress passes and Obama will actually sign (or have his veto overridden). The EPA’s Endangerment Finding is a target rich environment – it relies primarily and extensively on the IPCC. Boy have you got that right. The average age of the world’s greatest civilizations has been 200 years. I figure a government collapses when the number of bureaucrats and the number of laws completely strangles the wealth producers in red tape and taxes. And I’m rotfl seeing Grauniad trying to hush-up with a surprise front-page article saying climate skeptic Bjorn Lomborg now advocates spending money on reducing global warming. 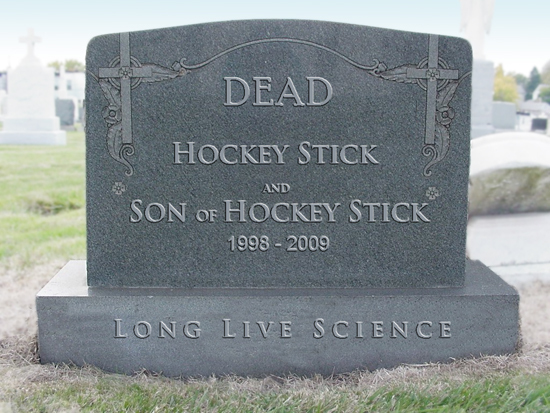 …because they know Mann’s hokey stick is dead. R.I.P. The guy on the right better hope he can sell a lot of bodice-ripper novels, because he’s gonna be as unemployed as his porky pal when the truth gets out. Only if there’s salt in it’s mouth, a stake in it’s heart, chains wrapped around it, and for good measure, it’s head chopped off and the brain destroyed. Is this what railroad-Pachauri would call “The End of the Line”? Having found this site this last spring, I am curious, it seems that the tide is turning on CAGW, how long has this trend been apparent? Not that I underestimate the enormity of the facade that is CAGW, it has a great deal of momentum. Well, after the victory of the Democrats in 2008, I predicted that limiting CO2 would fade as an issue for the Democrats and their supportive media. It was only a political tool to undermine the Republicans. It worked. 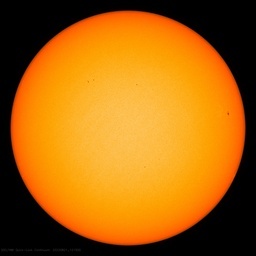 However, it will be as painful for the Democrats to control CO2 as the Republicans. So, ditch it. The Copenhagen farce quickly followed. The MSM is looking for a graceful exit. Their readers may be so ignorant they may find one. Expect a few efforts to raise taxes or increase Federal regulatory power, and then, some other issue will be created. Who knows, they may subsitute “climate change” for global warming and continue right on as before. They are already doing that in some writing. Josh needs to make the next one showing Ocean Acidification as a new born. To paraphrase Mark Twain : I won’t attend the funeral , but I will write a letter of approval . However , the reports of my death have been greatly exagerated may well be the case . Does that grave site and head stone meet EPA regulations? I bet they’ll go after the dead…probably already are…. The movement is not dead in California. We still have the citizens’ vote on Proposition 23 in November 2010, which if passed will suspend the state’s climate change law (AB 32) until the state’s unemployment drops to 5.5 percent for four consecutive quarters. Presently the unemployment is at 12.5 percent. This is one of the biggest issues ever to face California, and is generating intense interest and debate. What is very interesting is the change in emphasis from the AB 32 proponents. This was made into law on the basis of stopping global warming, yet now the proponents describe AB 32 as a jobs-creating law based on green energy technology. They have only a vague idea of what those technologies are or will be, or when they will be invented, or how many of the jobs created will actually be in California rather than in other states or other countries, and how much government subsidies will be required and for how long to sustain those companies that will be involved. Sadly, almost everyone I talk to has no idea what AB 32 is or does, or that Prop 23 is on the ballot. The election turn-out will likely be high since we are electing a new Governor. But, the wording of the Proposition is hostile, using words like “major polluters.” My feeling is that the average voter will read this wording in the voting box, and click NO because he or she thinks a YES vote will produce more pollution. Love the cartoon. Unfortunately I am pessimistic and feel that we will be haunted by the ghosts of AGW and the IPCC for a long time to come. I would have used a bigger stone to keep the buggers anchored. johnnythelowery: you were almost right. The report should be renamed AR5 backwards or AR5 first. Whatever happened to the Nuclear winter? Just as my generation were brought up on a diet of man-made global catastrophe that turned out to be just so much hot air, so this generation was being brought up on diet of man-made global catastrophe with has now evaporated as just so much hot air. I can already see the bargain buckets filling up with books warning about man’s impact on the climate. The newsmedia no longer see global warming stories as a trendy filler. Science researchers know that climategate really was a huge scandal no longer want to have any association with the subject. All that is left is a few paid-up lobbyists for the mega-corps who grew rich on the scam and a few jaded environmentalists who haven’t grown up yet. The BBC only reported on the IAC the day it came out. Nothing yesterday, as far as I know, and today the first half hour of Today news programme was 20 minutes (20 minutes!) about Tony Blair’s book, a slot about a new musical and yet more about the Pakistani cricketers. So either theBBC think that AGW is not important after all, or they are trying to distract us with bread and circuses. In Australia the Greens and Labor have formed an unholy alliance to help Labor regain Government. One of the Green demands was a consensus forum on climate change and the introduction of a carbon tax. In true democratic fashion the Greens are only allowing those who support AGW and a carbon tax to take part. Sceptics and even warmers who oppose a carbon tax are to be excluded from the consensus gathering. Obviously the Greens and Labor are concerned that the sceptics might destroy the consensus with those darn facts. Today’s Daily Telegraph (UK) has a marvellous cartoon of melting icey letters IPCC with horrified Pachauri skidding down the disintegrating final ‘C’. BTW…when I saw the BBC news item on the report on the IPCC, guess what visual accompaniments they produced? You guessed it! Melting ice, floods, etc., etc. RIPCC – lovely title, wish I’d thought of that! Might just amend that stone. How absolutely horrible that such a worthy candidate for the Nobel Prize was beat out by a slimy charlatan. I guess it is now the Ignobel Prize. The US is not a democracy Gail; we are a Constitutional Federal Republic with representative democracy. The IPCC is not dead and is not going away. Anyone who thinks it will is only fooling themselves. Don’t start yelling, “Victory!” too soon because you will most likely end up eating your words. OK, we can’t be 100% sure that it’s dead, but it is “very likely” that it is, which has been scientifically proven to mean a “greater than 90%” chance that it is. As used to be in very old times, they took all the gold, the servants, their wives, and the occidental culture to the grave with them. Or…may be it’s not dead. VOODOO science made it. Oh My!, now I realize it, PATCHY is a ZOMBIE! This IAC knuckle-rap will be very helpful in court cases, as it will undermine the presumptive authority of the IPCC’s consensus on settled science. The US courts rely on such consensues; they no longer are open to giving much weight to minority views. I suspect that an unspoken part of the motivation of gatekeepers in excluding or toning down (see Spencer’s latest paper) skeptical papers has been to create the appearance of a solid consensus when the courts get involved. Hmmm … I wonder if that is why the administration has asked that the courts not be allowed to rule on the science — because it knew that this damaging IAC critique was in the pipeline. Just heat it up around 3 degrees C. According to those guys, that’ll kill just about anything.